Prof. Mario Marzan of the UNC Art Dept. 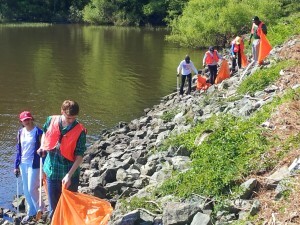 connected with Clean Jordan Lake in a unique way to help our cause while educating his students. UNC offers a "Maymester" course designed as a short and intensive 14 day semester. Students can take special topics that may not fit the regular semester format. Prof. Marzan's course is called The Walking Seminar. The goal is to engage students in a territorial investigation of the North Carolina landscape. He noted that "we are coming together to appreciate the outdoors and to examine the visual and aesthetic character of walking in nature. We are focusing on our role and responsibilities, not only through the lens of artists, but as members of society. We hope to foster an atmosphere of equal exchange and will be seeking ways in which as a group we could give back." On Thursday, May 22nd, these UNC students did 'give back' in the form of removing trash from a section of shoreline within the Seaforth Access to the Jordan Lake State Recreation Area. They collected about 20 bags of trash and many large objects including a propane cylinder, a football and several buckets from a low lying area in which trash routinely deposits after every big rainfall event. In fact, 5 inches of rain fell just 1 week before the cleanup raising the lake level by about 6 ft. and bringing yet more trash. Most of this is coming up the lake from the Haw River Arm, several miles to the south. Before the cleanup, students learned about the formation and management of the lake in a presentation by Francis Ferrell of the U.S. Army Corps of Engineers. Afterwards, they visited the Jordan Lake Educational State Forest and heard a presentation about forestry and natural resource management. After school on Friday, May 23rd, a group of 7 students in an environmental science class at Green Hope High earned their community service credit by volunteering with us. Their assigned area had never been cleaned before by our volunteers because the terrain is so very challenging. The students had to descend a steep embankment off the west side of Farrington Point Rd. near the bridge over northernmost arm to reach the somewhat unstable rip-rap of rocks. In between the rocks and up into the brush above lies a huge deposit of trash including many old propane camping-size cylinders. Adding to this load from careless water recreation is litter thrown out of car windows from the road above. The student organizer of the event was Natsumi Koyama. She said afterwards that "It was physically harder than we expected, but I was glad that we were still capable of the work. I would encourage more high school students to come out, because this event really opened up our eyes to how much trash that accumulates in Jordan Lake."